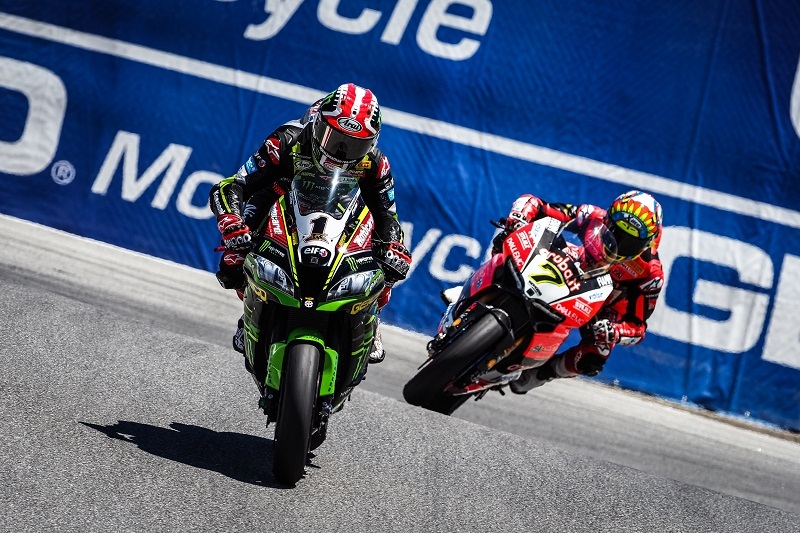 Jonathan Rea (Kawasaki Racing Team WorldSBK) proved that his Friday form was no fluke by taking his seventh win of the campaign in Race 1 at the WeatherTech Raceway Laguna Seca. The MOTUL FIM Superbike World Championship witnessed a new battle between the defending champion and Chaz Davies (Aruba.it Racing – Ducati), another chapter in the vast collection of showdowns between the pair. This time, it was the Northern Irishman’s time to shine in the blazing Californian heat – his third triumph at Laguna Seca. With both men starting on opposite sides of the front row, Race 1 quickly became a two-man affair, after Rea passed Tom Sykes (Kawasaki Racing Team WorldSBK) before Turn 1. A first attack inside that first lap from the defending champion at turn 11 was quickly shrugged off by Davies on the exit, but the warning shot had been fired. Behind, Alex Lowes (Pata Yamaha Official WorldSBK Team) began to pile the pressure on Sykes in third, with Lorenzo Savadori (Milwaukee Aprilia) crashing out after an excellent start from the lights. Seven laps passed with no further attacks on the Welshman – and as things turned out, no more were needed. Davies suffered a mistake through the corkscrew, and was then unable to keep up the pace in the closing ten laps. It’s tough to match the three time champion at the best of times – with a free track ahead, the task is nigh-on impossible. Rea drowned out any possibility of a comeback, keeping a consistent 1-2 second gap all the way through the latter two thirds of the race. With Davies ending the race in second, the two are now separated by 70 points in the standings, with eleven races remaining on the calendar. Behind the pair, Alex Lowes found his way quickly past Sykes into third, with the KRT rider falling slowly down the standings. The Lincolnshire rider has shown tremendous pace throughout the last three rounds, and following his maiden WorldSBK win with another podium – his first at Laguna Seca – spells excellent news for the Yamaha man going into tomorrow. Eugene Laverty (Milwaukee Aprilia) repeated his best performance this season with an excellent fourth, making it four different machines in the top four positions, and highlighting how far the RSV4-RF has progressed in recent races. The Irishman will also have the bonus at starting from pole tomorrow, at a track where a front row can be a near guarantee of success. Marco Melandri (Aruba.it Racing – Ducati) bounced back from a disappointing qualifying session with fifth in Race 1, an admirable climb from the fourth row. He passed fellow Panigale R rider Xavi Fores (Barni Racing Team) in the final laps. The Spaniard, top independent rider in California, will nonetheless be pleased with his progressive return to form. Much less comfortable during the race than through the earlier Superpole session, Tom Sykes ended his race successfully defending seventh place from Michael van der Mark (Pata Yamaha Official WorldSBK Team), who had to be content with eighth, in front of Jordi Torres (MV Agusta Reparto Corse) in ninth. Scoring his best result in WorldSBK, Jake Gagne (Red Bull Honda World Superbike Team) finished his home race in tenth place to the delight of all the American fans at Laguna Seca. Race 2 is live from Laguna Seca tomorrow, with lights out at 14:00 local time (21:00 GMT)! Catch all the riders’ reactions and more on our WorldSBK social channels and at WorldSBK.com.